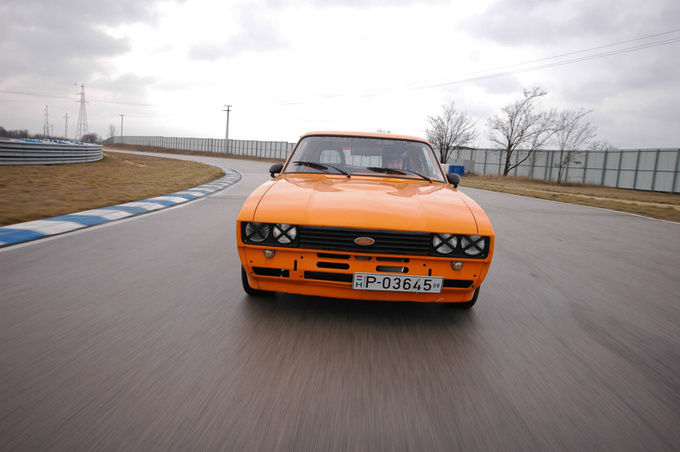 The first generation of the Capri was released in 1969. Based on the Ford Cortina it was to repeat the success story of the American Mustang. To make it affordable to the masses it was available with a wide variety of engines. There were even tiny V4 ones with 1.3, 1.5 and 1.7-litre capacity. The badass versions were the 2.3 GT made for the German market and the 3.0 for the UK customers. 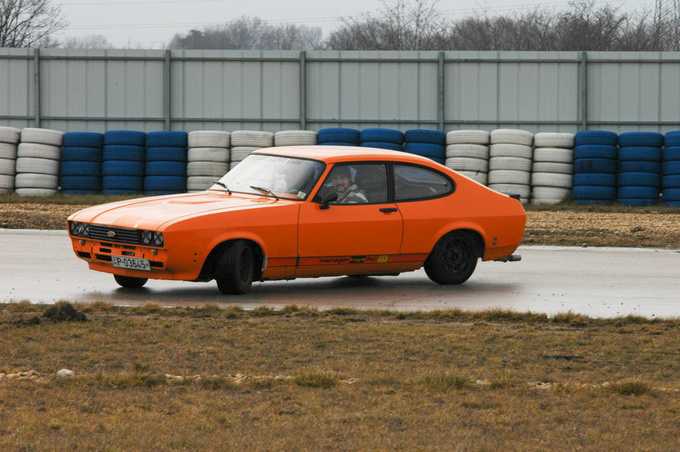 The Capri was manufactured in the UK, Germany, Belgium, and even in Australia. The rare V8 version called Capri Perana, which most of us have never had the chance to see, was built in South Africa by Basil Green Motors. The Mk 1 sold quite well, one million had been built by August 1973. 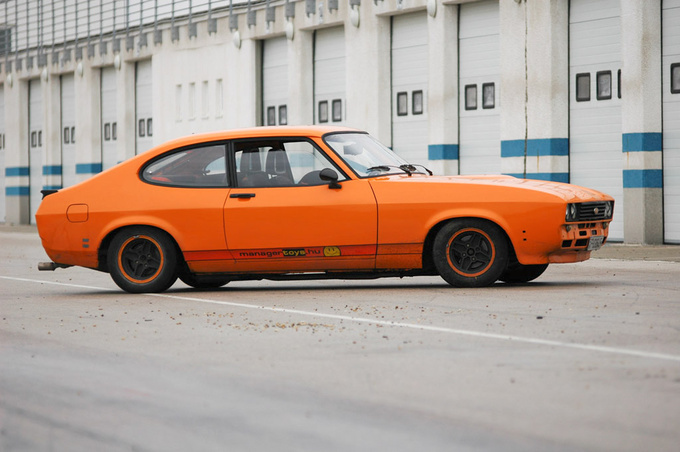 The two-door coupe was not only successful in the showrooms, but did well in the European Touring Car Championship, too, with drivers like Niki Lauda, Hans-Joachim Stuck and Jochen Mass behind the steering wheel. 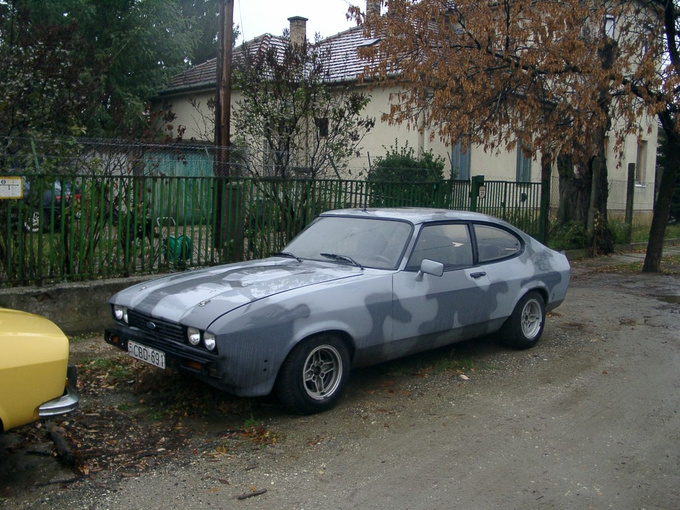 In 1974 Ford introduced the Capri Mk2, a three-door coupe with mechanics based on the previous model but revised bodywork. No V4 engines were available at that time, only 1.3, 1.6 and 2.0-litre inline fours and 2.0, 2.3 and 3.0 V6s. Sales numbers were below the ones of the Mk1, but still it made it to get a facelift in 1978. The Mk3 is just a very light revision of the previous series, having different taillights, headlights, bumpers, modified front fenders and hood. The Mk3 became a lot more popular than the Mk2. Many consider it to be a better design, plus the massive success of the Zakspeed Capris in the Deutsche Rennsport Meisterschaft (DRM), predecessor of the famous DTM, also helped it to gain popularity. In the early 1980's the walls of the petrolheads' rooms were covered with posters of the Capri silhouette-racers (only the roof was identical to the stock cars, aluminum tubes were used for the chassis covered with kevlar body panels). These fire-spitting turbo monsters have won several races and even the 1981 DRM championship. The Zakspeed Capris became the most iconic of all. I myself was not a real Capri-fan, unlike my cousin living in Germany. He was obsessed with Capris, but never had a chance to own one – or never really wanted it bad enough. In 2002 I just happened to find a 2.3 V6 at a wheeler-dealer. It was used and abused, not one of its panels was intact. But somehow it still had the charm of a little muscle car. To be honest, it was in perfect shape for what I had in mind: to use and abuse it. As it was very cheap, I bought it. 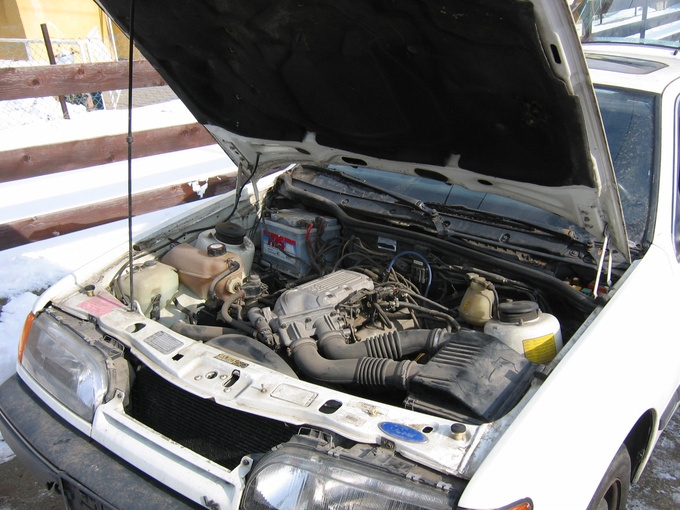 Then I accidentally found a 2.0 V6, which seemed to be a great parts-car. A donor. I drove the 2.3 for about a year or two, and started to cannibalize the 2.0 very soon, as the propshaft fell apart, the passenger side door's hinge broke, the starter motor gave up working, etc. I have even painted it matte black, as the metallic blue finish looked horrible. The matte black Capri reminded everyone of the Interceptor of Mad Max. Well, it really looked like a car after an apocalypse. It had some rust issues, and I luckily sourced a 2.8-litre engine and a 5 speed gearbox out of a Sierra XR4i. After some serious welding and having replaced the engine, the car received a new paintjob: I really liked the two-tone grey camo. Later howeverI had other things to do, and did not use the Capri at all. 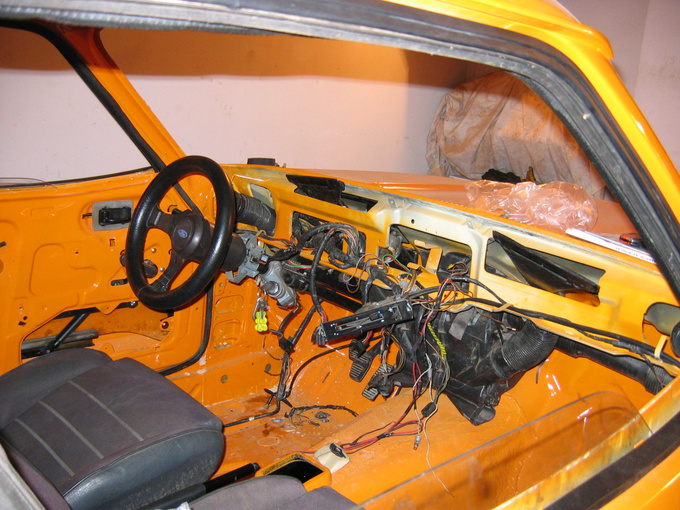 In 2005 a friend of mine offered me a gutted, empty Mk3 body. Not a single nut or bolt was left in it, all the bodywork had been done, so all I had to do is paint the car. 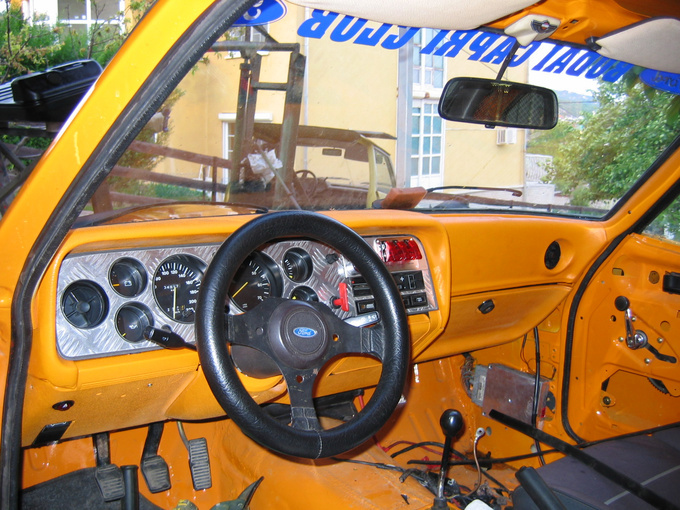 And to rebuild it using the suspension, interior and all the other components removed from the 2.3 and the donor car. Of course, it's easier said than done, and even the new body needed some extra care, but in approximately a year I had the Capri back on its wheels. I did the painting myself, and at this point I would like to thank my friend Gábor Buzadics, a professional car painter, for all his help and the tips he gave on how not to paint the body in a small garage. It is, of course, far from perfect, but I can live with that. I wanted to use the car to get into drifting, so chances were that I would bend a panel or two. This is why my expectations regarding the finish were not too high. I had removed the rust and the grime and repainted all the parts I fitted; nuts, bolts and other small thingies were galvanized – I just could not put greasy, rusty parts on a shiny car. This made the progress a little slower, but working with refurbished parts is a lot more fun. 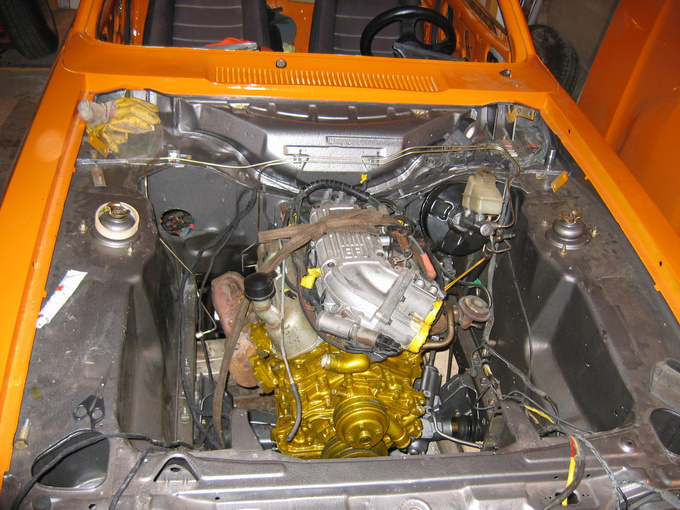 The 2.8 engine seemed to have compression problems, so I bought a 2.9 Scorpio (Granada in the UK) and ripped the engine and its auxiliaries out to use it in the Capri. The 150 PS Cologne engine is not a monster, but as I removed the bumpers, all the carpets and inner panels, it had an easy job moving the stripped body. The Capri has a live axle with leaf springs (mine has the single leaf setup of the original 2.8 version) on the rear, so the torquey engine makes the light body quite tail-happy. Which is good for drifting, isn't it? For improved handling (and looks, too) the car got lowered, and the front suspension received new polyurethane bushes. Upgrading to the rare power steering seemed like a good idea too, not just because it is more comfortable, but one can maneuver quicker, as well. No other modifications have been made to the car. I just wanted to go and drive it. I was really excited about it, as I had never driven a RWD car on track, and to be honest, I had never really tried to push the Capri to the limits before. I've always had FWD and AWD cars, so I was a bit scared to test my limits. I even had nightmares crashing the car on a narrow mountain road. One day I drove to an empty parking lot. I mean a really empty one, where there was no one to see me messing around. I tried to drift the car. Boy, was it a terrifying experience! I was sitting very low in a loud car with a bonnet as long as a ping pong table, and all this made orientation very hard for me. The tires were throwing pebbles on the brand new paintwork, fuel was spilling out at the filler cap, and I was just spinning around. Sometimes even making donuts seemed impossible as the stock diff left the inner wheel spin, so I was just burning rubber and making smoke uselessly. I got scared of every little bush and tree, not to mention the concrete blocks at the edge of the lot. After a few minutes I left the site as fast as I could, utterly embarrassed by my performance. I was confused and it suddenly dawned on me that drifting was a lot harder than it seemed to be. I learned my lesson. No matter how cost-effective the build was (just by doing the preparation and the painting myself I have saved at least 1500 bucks), I have put a lot of work into the car. I just don't have the heart to push it hard and risk bending a panel or breaking parts that are hard to source. I started using the car as a daily driver instead, and I also took it to a few trackdays, driving very carefully. I realized that what I needed was a car that I could distance myself from emotionally, one that costs next to nothing, and which could be repaired for the sum of one tank of gas if I ever hit the guardrails. I started to look for a Ford Sierra. What sort of a beast is that? A totally awesome one. 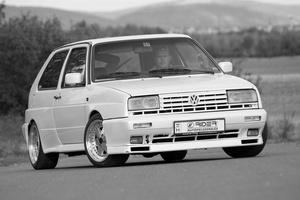 Behold the Golf Rallye G60. Square headlights. Just 5000 made. Radical!